Click here to see our upcoming program schedule! Learn to massage your dog. PetMassage™ helps young dogs develop and stay healthy, senior dogs stay vital, flexible, and playful, and all dogs become more healthy and balanced. Own and operate your own PetMassage™ Franchise. Guide other dog lovers to learn PetMassage™ who will help their own dogs and create more dog massage businesses. Introduction and Primary Training. 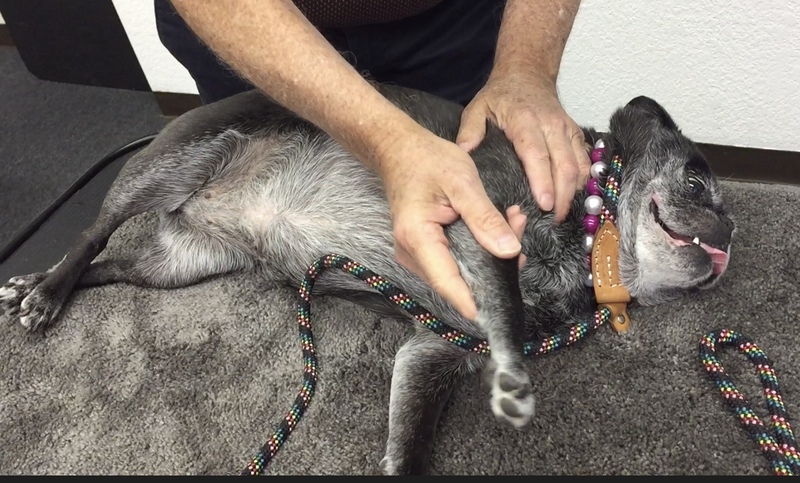 Learn the basic concepts, skills and knowledge set of PetMassage™, the PetMassage dog handling skills used in sessions, correct body mechanics so you can practice safely, easily and for a long time. Small classes with abundant informal individualized instruction with PetMassage founder, Jonathan Rudinger. Enhance and expand your PetMassage™ practice to be more comprehensive and effective. This workshop is a great balance of Right and Left brain activity. It includes in-depth energy work training, medical terminology, more advanced canine anatomy for the canine massage practitioner, kinesiology, gait and body mechanics, canine pathologies you will encounter in your practice, and exercises in business development and marketing. These are just a few of the many kind words students have shared with us about their experience with our programs and the Team of PetMassage™ Training and Research Institute. You can see a full list on our Testimonials page. The Foundation workshop exceeded my expectation and provided me with tools to go in any direction I choose. It has changed my life. I just wanted to Thank You for the most life changing 5 days of my life! Seriously! The training you provided is invaluable to me! Not only did I learn proper technique on massage, I gained so much personal growth and self awareness! I am confident that I will no DOUBT be the BEST Canine Massage Practitioner in Charlotte, NC thanks to your training. I am over the moon excited that I can say I was trained and instructed by Jonathan Rudinger! I look forward to continuing my training with the Advanced level as well! I loved how this workshop created an awareness on such a spiritual and energetic level. I feel like this course will change the way that I approach bodywork with humans. I plan on approaching this work with people and animals in a much more spiritual and energetic way. Thank you so much for everything you both have done! The awareness and new levels of understanding I have about animals and relationships with them, has increased more than I ever imagined! This was truly an experience of a lifetime. Thank you! As a teacher & computer trainer for twenty years, I’m pretty much a student with high expectations of an instructor. Jonathan knows his topics really well and he has a kind and gentle way of offering knowledge as fast as we can soak it up! Thank you for being a loving teacher to your students. I sure learned a lot and enjoyed every day. Just wanted to drop a quick line to thank you for one of the most wonderful weeks I’ve had in a long, long time. Not only did I learn a ton, but I feel PetMassage™ is one of my truths. It’s a path I will follow. Your approach to massage for dogs is insightful, intuitive, sensitive, compassionate, yet very powerful… and all with a light, loving touch. You have truly touched my soul and opened up a path that I’m destined to follow. Thank you for making such a powerful difference in my life…and as a result a powerful difference to the many dogs that I will touch. I’m very happy with everything I learned in this workshop. I researched several animal massage schools before attending PetMassage™ Training and Research Institute. I felt PetMassage™ would best meet my needs. After attending PetMassage™ I felt it had met my needs and greatly exceeded my expectations. Thank you, Jonathan and Anastasia. The things learned in this class can’t be obtained through on-line or by reading. The hands-on teaching and the discussions were very enlightening on both a personal level and a professional level. I have learned so much in the last 5 days, both about myself and about the connection we have with dogs. It is a profound thing and I am blessed to have learned from the animal massage pioneers. Thank you. You are a great teacher. Thank you so very much for creating and offering PetMassage training. The drIve back to Pittsburgh allowed for “quiet” time to reflect on the course context and honestly, I cannot thank you enough! This has enriched my life not only because of my deep passion for animals and desire to learn the art and science of animal massage, but it was your energy work that has opened up a whole new dimension for which I’ve had very limited exposure. I can see that allowing for flexibility during the course training that I would not have been part of the systemic conversions relating to energy work and I see how necessary it is in my everyday life and most definitely to maximize animal massage! Then to top it off, I now have you as a mentor! I have tremendous respect for your knowledge and for the business that you both have built, plus I like to learn and grow personally and professionally. I am looking forward to a long relationship. I did not expect such a strong emotional connection. Major energy shift while working with the positional release. Very knowledgeable, good communicator, clear confident speaker. Books, manual, and videos are very informative and easy to follow. Dear Jonathan and Anastasia: I wanted to send you my heartfelt and spirit felt thanks for a wonderful, life changing workshop!! It has inspired me to a whole other level. I cannot thank you enough! I can only liken it to finding the missing piece in the “puzzle” that is my life, my purpose. I am looking forward to seeing you both in September, for the PetMassage™ Advanced Workshop. I really enjoyed the hands-on work, learning the massage skills, and seeing how they can make a positive difference in the life of the dog. Click here to shop our full store. Grounds for exercises in intuition. With each dog I see behind what I see, imagine beyond what I imagine, and I know more than I know. My client dogs and I agree. Every canine aquatic massage session is a profound and ecstatic experience. My PetMassage is safe and effective as I combine breath, presence, intention, and my understanding of how the dog’s body moves. A Walk in the Woods is open to interpretation. Click here to browse our full blog post archive. "Upcoming Event April 20th, at PetPeople, Toledo"
Come join us and Jonathan Rudinger (founder and instructor at the PetMassage Institute) as he does mini sessions of canine massages on your dog at for FREE! Jonathan began his massage career in 1982 and is a medically trained licensed human massage therapist and registered nurse. For over 20 years, Jonathan has devoted his life to developing and perfecting the practice of canine massage. Learn how PetMassage can help your dog. Jonathan’s books will be available to purchase. Jonathan is a guest in episode 29 of this podcast. Sign Up For Free Weekly Blog Helpful Hints and Musings from a Practicing Professional and Anastasia's Affirmations.